Museum of Seasons is a permanent exhibition space, displaying the images of La Foresta during every past season of the journey by every artist who has contributed their imagination and created a seasonal portrait. By clicking on the artist's name you will be directed to an online gallery showcasing a selection of their work and their reflections about it. “I think of the forest as a space of calm, of shelter, of contemplation. I think of it as a fertile space to inhabit or transit, but also as an unembraceable, wild and unknown…. a place where the unexpected is possible, where the encounter, the surprise and the relationship between the elements is as, or more, important than the things themselves.” Click here to visit the page of Diego Mallo, author of Winter portrait 2018-2019. “I want to salvage and revive our connection to the natural world. I study rich hand craft traditions, using them in collaboration with found botanical and organic material; symbolically binding nature and the human touch.” Visit the online gallery of Hillary Waters Fayle to look closer at the Autumn 2018 portrait she created and explore her seasonal, intricate and sensitive work. To visit the online gallery of our artist of Summer 2018, Andrea Antinori, and discover his playful, humorous and joyful work, with lots of attention to detail, imagined and created in Bologna — make a click. Spring 2018 was brought to la Foresta by Ana Pez. Ana is based in Madrid, she is working on a wide range of projects including illustration, book- and cards-making, mural painting, album covers, websites, posters, and theatre design. To visit her online gallery click here. "The forest gives me a sense of peace and security now when I live in a big city. This experience deeply influenced my passion for simplicity, for sense of solitude in my art, and attraction to small things in life that many people overlook." Visit the gallery of Karolina Skórka, our winter 2017/2018 artist, here. "When I am in the forest, that is, when I inhabit my body, I have no doubt I am in the right place and I know it. That’s when my thoughts realize it and stay silent for a while. What happens to me in those moments I can not explain in words, this is why it is better to dance, sing, hug, cry, jump into the river, laugh or make illustrations." See and read more at our autumn artist's Violeta Lopiz personal gallery of the inner forest. In summer 2017 our invited artist was Ana Ventura. Ana is a multi-facetted artist and illustrator, working with a wide variety of media. She is creating illustrated books, embroidery sets, decorative wall stickers, photographs, screenprints, postcards, clothes and accessories. Things didn’t have name when we were forests. "Perhaps we are all foreigners, exiled in the City, always with nostalgia for a distant Forest", - writes Jesus Cisneros, the author of spring portrait of La Foresta. More on longing for the time when we were woods you will discover visiting the delicate exhibition of Jesus' work. In winter 2016/2017 Britta Teckentrup, Berlin-based illustrator, has created 2 portraits of La Foresta - this one is a snowy dress La Foresta wore for the rest of winter. Have a stroll at Britta's gallery. In winter 2016/2017 Britta Teckentrup, Berlin-based illustrator, has created 2 portraits of La Foresta - this one was for the festive season of winter holidays. Britta's gallery is dedicated to landscapes and the changing seasons of nature and of human life. Much of the artwork of Adolfo Serra is dedicated to nature as something huge, overwhelming, simple, brutal, beautiful; to humans as creatures of nature; and also to the inner nature, growth, maturity, change and inner journeys. It's about one’s need to seek their own forest to grow, to meet, to be true to their own nature, whatever it is. Viola Niccolai is an illustrator and picture book maker. She has created this portrait of La Foresta in spring. For further exploration and insights into her process of creation check out our interview at Creativity Cookbook or on Vimeo. 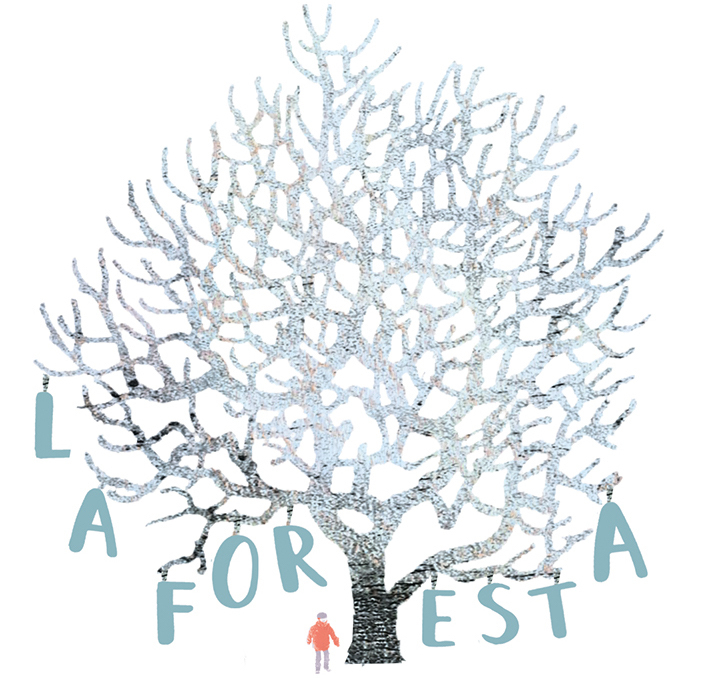 Creator of the first seasonal portrait for La Foresta, just at the time when she was born, is Valerio Vidali. Valerio is an illustrator and creator of picture books, wooden toys and sculptures. His books have been published in many countries around the world.